Still not convinced the need to lock down your account!!! visit http://youropenbook.org/. Its a website that lets people search through the content posted by other people, who didn't bother to keep their updates private!!. A quick look at the recent searches will give you a glimpse of real danger!!. So hope that site will make you understand the need for privacy [:P]. But unfortunately the privacy settings in FB are not that simple, even if you master it today it will definitely changed in few days!!. To add to the complexity, FB follows the "opt-out" policy than the "opt-in",which will make the profile public by default and gives you an option to opt-out! !.It should have been the other way around!. 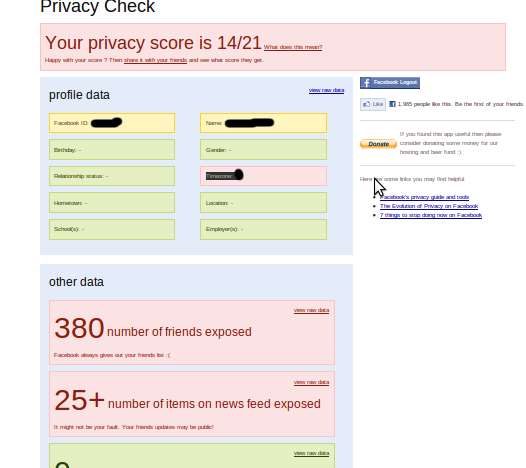 Anyways, there are few apps/sites that will let you check the privacy level of your FB profile. 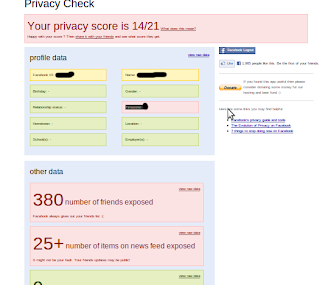 This is a FB application that will let you rate your profile privacy out of 21.It seems its impossible to hit a score of 21.I have found that a score of 15 will ensure you a profile with enough privacy. Mine was 14 before I changed the settings. As a foot note, you can in-fact lock down your account to 100%, but then there won't be any point in having such an account. So have look at your score and decide on your self what to expose and what not to. Another good tool is Reclaim Privacy but it was not working at the time of writing of this blog, hopefully soon it will be back in action. What made FB so popular is the huge collection of apps it had.Which has now become the most serious threat to the users, because of the fact that once you let an application access your profile,by default it will have access to all your personal information until you manually revoke it!!!. So far I haven't found any easy way to say which all applications are harmful and which are not!!. The best thing to do now if you are serious about privacy is go to Application Settings by clicking the Account tab on your top right side and remove all applications that you are not using now.You may have to check this list often to make sure that no apps have sneaked in.